I’m very excited to spend some quality time with the ocean this weekend. Well, as long as it doesn’t rain, but I certainly won’t complain if it does. California is in desperate need and so is my car. Assuming all goes to plan, I will be joining the Surfrider Foundation for their beach cleanup in Santa Monica on Saturday morning. If you’re in the area and want to go, you can get more information and RSVP on their Facebook event page. There are always clean ups happening all across the nation, not only at beaches, but lakes and rivers as well. Just check the Surfrider website to locate a chapter near you. I have lived in California for the majority of my life, yet I haven’t fully experienced all it has to offer. It wasn’t until I spent this last week in Lake Tahoe, that I realized what I had been missing out on. I was listening to my favorite podcast yesterday, Design Matters, and an interview with artist and designer Elle Luna came up. A little more than halfway through, an excerpt from her online manifesto “The Crossroads of Should and Must” was read aloud and it really struck a chord with me. In it, she talks about making the jump from should to must. Should is what other people expect of us, how they think we should or shouldn’t live our lives. Must is who we really are and what we believe to be our truest self. We are constantly faced with both choices in all aspects of our lives and often times we do what we should because it’s easier and the risk is smaller. When we choose must, it’s difficult because it forces us to listen to our inner voices and pursue something unknown. But by doing so, we are able to find our true calling, and make what we do and who we are one in the same. We all have our habits, some we are aware of and some we don’t even realize we’re doing. It’s easy to just take a back seat and go through the motions. So let’s take back control and make our lives and planet happier. 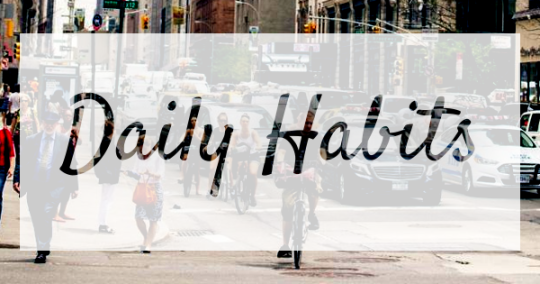 Let’s bring more awareness to our daily habits. Pay attention to what you do, why you’re doing it and how you might be impacting yourself, the environment or those around you.